Before going to the thick of the multivariate summarization, this chapter first considers the concept of feature and its summarizations into histograms, density functions and centers. Two perspectives are defined, the probabilistic and vector-space ones, for defining concepts of feature centers and spreads. Also, current views on the types of measurement scales are described to conclude that the binary scales are both quantitative and categorical. 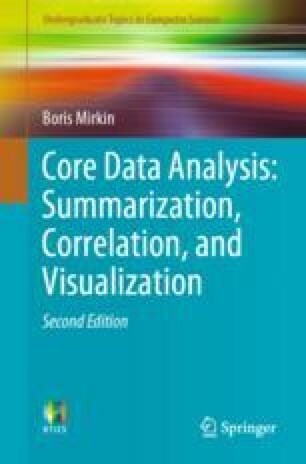 The core of the Chapter describes the method of principal components (PCA) as a method for fitting a data-driven data summarization model. The model proposes that the data entries, up to the errors, are (sums of) products of hidden factor scores and feature loadings. This, together with the least-squares fitting criterion, appears to be equivalent to finding what is known in mathematics as part of the singular value decomposition (SVD) of a rectangular matrix. Three applications of the method are described: (1) scoring hidden aggregate factors, (2) visualization of the data, and (3) Latent Semantic Indexing. The conventional, and equivalent, formulation of PCA via covariance matrices involving their eigenvalues is also described. The main difference between the two formulations is that the property of principal components to be linear combinations of features is postulated in the conventional approach and derived in that SVD based. The issue of interpretation of the results is discussed, too. A novel promising approach based on a postulated linear model of stratification is presented via a project. The issue of data standardization in data summarization problems, remaining unsolved, is discussed at length in the beginning. A powerful application using eigenvectors for scoring node importance in networks and pair comparison matrices, the Google PageRank approach, is described too.